ABIDJAN, C�te d'Ivoire � The new wing of the Sofitel Abidjan Hotel Ivoire was inaugurated on Friday, May 15, in the presence of HE the Prime Minister of C�te d'Ivoire, M. Daniel Kablan Duncan; M. Tiemoko Yad�, President of the Economic and Social Council; M. Amadou GON Coulibaly, Minister of State, Secretary General at the Presidency; M. Amon Tanoh, Minister, Chief of Staff of the President; M. Roger Kacou, Minister of Tourism, distinguished members of the government and representatives of the company Palaces de Cocody (SPDC). Located in the upscale neighborhood of Cocody, the Sofitel Abidjan Hotel Ivoire is a legendary oasis combining French luxury with African culture. Overlooking the Ebri� lagoon and the Plateau, this 5-star hotel stands majestically in a lush setting amidst greenery and water. Sofitel Abidjan Hotel Ivoire, meeting the requirements of all customer segments, becomes the Sofitel reference in West Africa and consolidates the presence of the Accor Group in the region, which now has 17 Sofitel hotels in Africa and the Indian Ocean. � We are very pleased on this inauguration day. It is a great moment for Abidjan and C�te d�Ivoire to see the achievement of the renovation of the second building of this hotel managed by Accor under the Sofitel brand. The hotel is once again a reference of hospitality in Africa. �, declared Mr. Thierry de Jaham, General Manager of Sofitel Abidjan H�tel Ivoire. The Director General of SDPC, Ms. Maf�rima Diarassouba, said �By appealing to the Accor Group, the company � Palaces de Cocody � sought to strive for excellence in the renovation as well as in the management of this historic hotel in Abidjan." 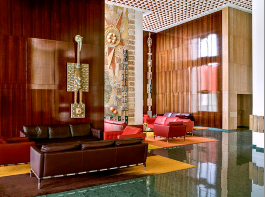 This exclusive hotel in C�te d�Ivoire was built by architect Moshe Mayer in 1963. The Tower Hotel has been beautifully restored in 2011 by architect Pierre Fakhoury, who continued the works in the Main Building. In July 2012, attended by representatives of the Ivorian government, SPDC and Accor signed a management contract, entrusting the fate of the hotel to Sofitel from 1 January 2013. The renovation of the Main Building completed, the iconic hotel today offers a harmonious blending of the Sofitel brand�s expertise with the best of Ivorian traditions. Sofitel Abidjan Hotel Ivoire offers 392 rooms, including 121 suites, 1 presidential suite and 31 apartments, with a total capacity of 423 keys. For the interior, Pierre Fakhoury has enlisted the services of French-Argentine designer Luis Laplace. The force of nature, bright colors, the materials such as gold and wood, are all symbols integrated in the decoration. The art of composition reflected in the patterns of Ivorian fabrics, geometry shapes and simplicity inspired the designer. Sofitel Abidjan Hotel Ivoire now has four restaurants. In addition to � Le Toit d�Abidjan � - located on the 23rd floor, offering panoramic views of the city and the Ebri� lagoon� and � La Gourmandise � at the heart of the hotel, where African poetry meets French flavors, guests will find � Le Pavillon �, a typically Ivorian restaurant, and finally � La Brasserie Fran�aise � offering the great classics of the French cuisine. This offer is completed by the pool lounge, � L�Oasis �, and 2 bars, � Cocoa Lounge � in the Tower and � Link bar � in the Main Building, a shopping mall with 11 shops and a 3D cinema with 386 seats. The hotel also offers 20 meeting rooms including 9 new rooms, all equipped with high- tech audiovisual equipment. Next to the hotel, the Abidjan Convention Centre features an auditorium with 1,650 seats. Guests who are PLATINUM Members of the Club Accorhotels loyalty program, looking for exclusivity, will benefit from the services of the Mill�sime Club at the Mezzanine. Finally, the So SPA, 1,200 square meters dedicated to well-being, will be opening soon. Sofitel Luxury Hotels is launching its new flagship in West Africa, the Sofitel Abidjan H�tel Ivoire. Located in the chic Cocody district and blending French luxury with African culture, Sofitel Abidjan H�tel Ivoire overlooks the Ebrie lagoon and the Plateau. The Ivory Coast property was built by architect Moshe Mayer in 1963, and revamped in 2011. 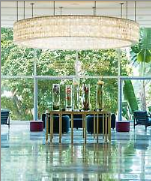 Sofitel signed a management contract for this property in July 2012 and 18 months later, following a transitional period of adaptation to bring the hotel in line with brand standards, the Sofitel H�tel Ivoire opened in early 2014. The Sofitel Abidjan H�tel Ivoire offers 209 guestrooms, including two presidential suites and 40 junior suites. Each one is inspired by Ivory Coast culture combined with a French touch, and with warm tones that give a special charm to every room. Sofitel Abidjan H�tel Ivoire also features two restaurants. The panoramic Toit d�Abidjan is located on the 23rd floor and offers a 180� view of Abidjan and the Ebrie Lagoon.At La Gourmandise, the poetry of Africa meets the flavors of French cuisine, at the heart of the hotel. The hotel also has four modern conference rooms fitted with high-tech audiovisual equipment. And starting in early 2015, a second wave of renovations is scheduled to create 217 guestrooms, including 84 suites and 31 service apartments, a Mill�sime Club, a 1,200 m2 So SPA, two restaurants and a lounge bar, a cinema, nine meeting rooms, a business center and ten boutiques, as well as a casino. Cote d'Ivoire a longtemps �t� le miracle �conomique de l'Afrique et une mod�le de stabilit� sur le continent Africain. Un lien avec la France jamais l'ancien pays colonisateur jamais compl�tement brise, les dirigeants post-independance ont longtemps courtises la capitale fran�aise pour cr�er une infrastructure moderne et une prosp�rit� consid�rable. Houphouet-Boigny, le pressaient qui fut en poste tr�s longtemps �tait tr�s charismatique, et il �tait pour promouvoir l'ides d'un amalgame heureux du capitalisme occidental pragmatique avec des valeurs africaines. La soci�t� qu'il a pr�side, �tait cependant loin d'�tre lib�rale et le reve a pris fin avec sa mort. Toutefois, le pays regorge de quelques-unes des meilleures attractions naturelles en Afrique de l'Ouest comme le vaste Parc National de Tai de la foret tropicale et la chaine de plages le long de la cote atlantique. c'est aussi une terre riche en tradition due a un m�lange de diverses tribus qui comprend les peuples Dan, Lobi, Baoule et Senoufo. Mais c'est vraiment la modernit� qui d�finit la Cote d'Ivoire, et qui la distingue des autres pays d'Afrique occidentale. 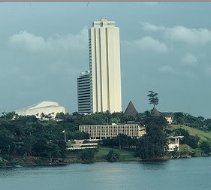 Abidjan est d�cid�ment a part, elle propose en effet des gratte-ciel scintillant qui etonne encore de nos jours. Yamoussoukro dans le Centre est celebre pour sa basilique, une r�plique �tonnante de la basilique Saint Pierre de Rome, qui incarne l'erre Houphouet-Boigny, en quelque sorte, le lieu actuel de l'Afrique dans le monde d'aujourd'hui, puisque la philosophie du grand montre peu de signes d'affaiblissement. Abidjan est la capitale �conomique et la plus grande ville du pays, mais elle a toujours eu une r�putation mitig�e suivant les voyageurs. D'une part, il s'agit d'une fastueuse et vibrante ville de gratte-ciel, des boutiques chics et des restaurants de qualit� parisienne quatre etoiles - certain la nomme "Paris de l'Afrique de l'Ouest. Yamoussoukro est la capitale politique du pays, sans ambassades, des minist�res ou des flux commerciaux cons�quents, Yamoussoudro est surtout connu pour sa basilique. FOLLOWING the successes and recognition of the Ikegun Village, Ibeju-Lekki, Lagos-based La Campagne Tropicana Beach Resort, which features the inviting ambience of the Atlantic ocean and the fresh water lagoon, as a world class Africa themed resort, the government of Cote d� Ivoire has agreed to a partnership deal that would see to the creation of 20 La Campagne Tropicana Beach Resort at 20 different locations in the country by La Campagne. This development was the outcome of a meeting between the founder and President of La Campagne, Otunba Wanle Akinboboye and the government of Cote d� Ivoire led by the Minister of Tourism, Mr Roger Kacou and the president of the country�s Tourism Development Fund, Mr Marc Vicens. In a letter conveying this decision, the Cote d� Ivoire Minister of Tourism, Kacou said the decision to partner with La Campagne is because of the African concept of La Campagne, its infusion of Africa architectural design and culture blended with a contemporary feel. Kacou revealed that it is this kind of concept, which allows for the promotion of African culture, the natural and eco-tourism friendly element of Cote d� Ivoire and other African countries that his country look to promoting as its stepped up plans for the revival and promotion of its tourism. Work is expected to begin soon on the building of these 20 La Campagne resort as the locations for the project have already been identified and even toured by La Campagne president during his recent visit to the country. In a related development, La Campagne has also been invited alongside Nigeria officially as special guest to SITA 2014 with the mandate to organise and lead the Nigerian team to the event, which is billed to hold at the Golf Hotel, Abidjan between February 26 and March 2, 2014. SITA, is a yearly travel and tourism trade exhibition organised by the country�s Ministry of Tourism to promote Cote d� Ivoire tourism and encourage interaction with businesses and other key stakeholders and operators in the different sector of the economy. Nigeria has been offered an exhibiting space of 40 square metres at the Village decouverte Du Monde to display her attractions and also allotted 15 minutes to perform at the opening ceremony while Nigerian Day is fixed for February 28. A big and sumptuous gala night is expected to hold on Saturday March 1 with Nigeria as special guest and has 30 minutes to perform at the event. La Campagne is given an exhibiting space of 18 square metres to also exhibit its various products, particularly a model of La Campagne, which is to be one of the major highlights of the exhibition. 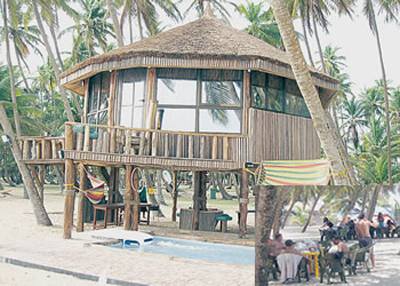 Already, La Campagne has intensified preparations for the event as it has presently embarked on a national mobilisation effort to enlist the participation of the various tourism associations, operators, stakeholders and allied businesses. The Federal Ministry of Culture, Tourism and National Orientation, Nigerian Tourism Development Corporation (NTDC) and states ministries of Culture and Tourism are also being canvassed for the five days event. La Campagne has promised to make the event one of the best outings for Nigeria in recent years as only the best and serious minded operators and businesses would be selected from the growing list of Nigerian operators and companies who have indicated interest at attending the event. Abijan, Cote d'Ivoire: Having heard our Associate Editor Muguette Goufrani sing the praises of her life and times in Cote d'Ivoire and other West African countries, I was full of anticipation as we boarded the Air Afrique jet at the Cotonou, Benin Airport, bound for the legendary Ivory Coast. As serendipity plays a big part in many of my African journeys, the first Ivorian we chanced to meet en route was a Mr. Gakpo, "The Lobster Man of Abidjan" (a possible song title), who kindly invited us to stay at his seaside inn the following week. That opportunity was a special treat for several reasons, one being that the Inter Continental Hotel Ivoire was full to the rafters and rooftops, due to an Africa-wide financial summit. I'll never forget Mr. Gakpo's stadium sized outdoor dining area, open to the moist Atlantic breezes, and topped by a traditional West African thatched roof. While wining, dining and cracking red lobster shells, one can watch the ever-present fishing boats bobbing up and down in the waves, in search of fresh seafood for tomorrow's table. Photo of the Atlantic coast, courtesy of Best of Africa Hotel. Photo below courtesy of Haury Tours< Abidjan. Meeting Therese Haury was another milestone. Like Mother Teresa of another era, this travel agent extraordinaire is dedicated to helping Ivorian villagers equip and supply local health clinics. Her souvenir- filled residence overlooks Abidjan, the Paris of West Africa. I plan to devote an issue to the elegant new homes and modern lifestyle I saw emerging, as this young giant of a city, the Paris of Africa, enters the new millennium. We visited every district by taxi, which proved to be a relatively low cost mode of travel. 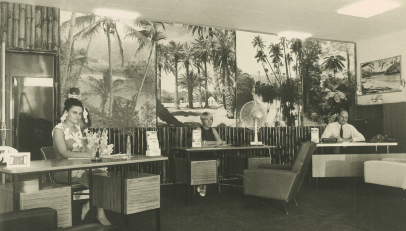 Haury Tours operates two travel agency offices - one in the central lobby of Abidjan's 750- room Inter *Continental Hotel Ivoire (below right). 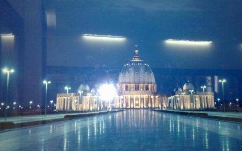 During my first visit to the hotel, Manager Peter Janssen suggested we visit the 'basilica' at Yamoussoukro (the capital). Air Afrique showcased this 'wonder of the world' on Africa Travel Magazine's back cover in 1996, the same year as our trip. "You've come this far," I told myself, "why not go all the way?" So, when the sun rose over the coconut palms at Lobster Village the next morning, I decided, rather than fly or drive, we'd 'go native' and purchase tickets on the local bus. Indiana Jones in Abidjan: A taxi took us to the bus station at Adjame, which was like something out of a Bogart or Indiana Jones movie - mingling crowds, a cacophony of sounds, street vendors everywhere - even a special room for the Muslim population to perform its ritual prayers. I didn't know it then, but there are several classes of buses available, and we chose the bargain version, a half day milk run, with countless stops and some unexpected adventures, which in retrospect made the journey more memorable. Arriving at Yamoussoukro, the elegant Hotel President, another Inter *Continental, became our center for a taxi tour of the city. After a refreshing lunch of aloco (bananas, onions and grilled fish), foutou (yams) topped by an icy cold, long-necked bottle of Flag beer at a local 'maquis,' (open air restaurant) we drove by the walled Houphouet- Boigny residential palace. Its version of a moat is a series of ponds occupied by a horde of hungry crocodiles. What a fantastic setting for the next James Bond or Indiana Jones movie. Speaking of classic, grandiose settings, Yamoussoukro's basilica, a replica of St. Paul's Cathedral in Rome, lived up to its billings in the Air Afrique advertisement. Palatial grounds and marble columns gave it a regal presence - and 36 giant giant stained-glass windows, splashed a kaleidoscope of colors across the interior, in changing patterns. We vowed to spend at least one Christmas week in Cote d'Ivoire, to hear the choir and enjoy the blend of traditional European and exotic West African music. I congratulated myself for turning over my camera to a local volunteer who stayed by our side for almost two hours. That way, for $30 US, we were free to take in the atmosphere, and visit every corner of one of Christianity's most awesome sites, while he recorded the occasion for posterity and future publication such as this. From these 36 treasured photographs, we have enough images to produce a fine coffee table style book. With much more to see and do in Abidjan, we chose a speedy bus for the return trip. Muguette Goufrani, Africa Travel Magazine's Francophone Editor covers West African destinations and events in detail. Her native language is French and she has lived in five West African countries, working for Air Afrique, Royal Air Maroc and Citroen. As a Travel Agent, she worked in North Africa, where her family operates an inbound tour company, and later in Tahiti and Cambodia. Muguette has been a partner in the magazine since it was founded in 1995. E-mail Muguette with your travel experiences in Cote d'Ivoire and other West African destinations. We welcome your input.